Country music’s megastar Willie Nelson is beloved by fans for both his unique musical sounds and his action-packed movies, but much of his energy and excitement on stage comes from the magical power of his golden-toned guitar. So says noted Chicago area psychic Joseph DeLouise who explains Nelson’s guitar is a tremendous reservoir of creativity because of the autographs of all the country music greats who have signed the instrument. It’s those high energy signatures, as much as Nelson’s innate talent, that give the star much of his magnetism. This metaphysical instrument, named Trigger, Jr., is an acoustic Martin N-20 Classic made of rosewood, spruce and ebony which retailed for $475 when the performer purchased it back in 1969. The star remarks that Trigger Jr. wasn’t his first guitar. “The Baldwin company gave me a guitar with a pickup on it,” relates Nelson. A pickup is a device to electrically amplify the instrument. “I dropped the Baldwin one day and busted it. So I had the Baldwin pickup put in this Martin Classic. The tone knocked me out when I first heart it. “I’ve tried putting other Baldwin pickups in Martins, but I can’t get an equal sound,” he explains. According to Nelson, Leon Russell told him having somebody sign your guitar was a good insurance policy. “I had Leon sign it, and as I traveled around, I got everyone else I worked with to autograph it,” the singer smiles. Nelson says he has so many names on the instrument now he can’t even remember everybody who has signed it. The all star crew includes such big guns as Kris Kristofferson, Waylon Jennings and Rita Coolidge. DeLouise explains that the signatures contain the energy of the stars they belong to, and this energy is transmitted to Nelson everytime he picks up his instrument. “Nelson is a metaphysial genius,” says DeLouise. 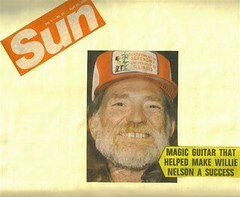 “By having fellow performers sign the guitar, Nelson taps into their greatness. Their talent and their energy becomes part of Nelson’s talent and energy. DeLousie claims Trigger, Jr., is so powerful that if you placed the guitar in a museum, people walking by it would feel the energy. According to DeLouise, most successful people use a metaphysical technique similar to this one to help acieve their goals. It’s the same idea as trying to touch somebody who is famous or wanting a photograph of somebody great.Â By having that part of the person whom you admire in your possession, some of that person’s magic rubs off on you. This entry was posted on Saturday, February 25th, 2012 at 7:12 am and is filed under Trigger. You can follow any responses to this entry through the RSS 2.0 feed. You can leave a response, or trackback from your own site. 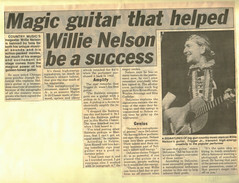 Great story, I love Willie and his guitar. Its not a mafical guitar, rather Willies magic has transposed it to that state.. It comes from the great soul that he is.. And I thank-you Willie, you have changed my life, for wich I am eternally grateful, and we will pay together once again, on the other side..